Denny is coming from five years experience as a mortgage loan officer here in the Fredericksburg area. Prior to that, he has over twenty years of successful sales experience in the medical products, insurance and transportation fields. 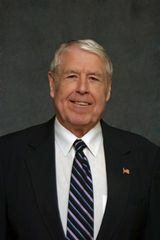 Denny is active in the community, has served on the board of directors of a low income housing facility for the elderly as well as an assisted living facility. He has served as President of a high school booster club and is active in community music and small theatre groups. Denny has a Bachelor of Science degree in Agribusiness with an emphasis on marketing from Iowa State University.